If you don't know yet, 23 is my favorite number. It represents a lot great things in my life, including the date I published my first novel, 3/23/10. 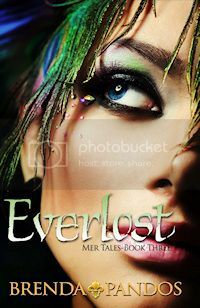 So, I love EVERLOST is only 23 days away! Have you entered my fun contest yet? You can tweet and post stuff everyday until 2/28! Thanks to all of you who have been EXTRA CREATIVE and spread the word. I've seen EVERLOST avi's, my name shared on lots of posts and even a PINTREST page for my mer folk *swoon*. So if you email me with your creative awesome sauce and your address at: brendapandos(at)gmail.com, I've got a present for you (while supplies last). Here's another chance to be EXTRA CREATIVE. For those of you who'd like a widget for your blog, I have the code! Thanks EVERYONE! You make what I do so fun!! !